Crooked Stave | Beer Apprentice - Craft Beer News, Reviews, Interviews and Info. Hey everyone. I hope all has been going well. It’s time to get back to the craft beer reviews and for today’s tasting I’m going to be drinking the Crooked Stave Vieille Artisanal Saison produced by the Crooked Stave Brewery located in Denver, Colorado. This will be my first experience with anything from these guys. I’ve heard good things, so I’m really looking forward to it. The website, crookedstave.com, gave up this bit of info regarding the Vieille Artisanal Saison. Alrighty. Let’s drink this thing. This beer came in a 12.7 oz. bottle with an ABV of 4.2%. It poured a hazy, yellow to gold color with a white head. The crown was sized very well and the texture was sudsy, soapy and a touch fizzy. The retention time seemed ok, but the lacing was mostly average. Still not bad though. Definitely a pleasant looking beer. The nose brought forth a decent shot of funk and oak while a light lemon citrus note crept in after a few seconds. As it continued to warm I began to gather some of those typical Saison aromas. Hints of hay and fresh grasses along with a wee bit of peppery spice and earthiness. Not bad. Not all that robust, however rather suitable. The taste was even more light than the aroma. It was muted quite a bit actually. A lot of the same characteristics were found in the taste though. Lemon citrus, oak, funk, musty hay and grasses. It almost had a floral type of taste as well. The mouthfeel was medium to thin. Somewhat watery to tell the truth. Very smooth, crisp, refreshing and thirst quenching. The carbonation was good, although not a terrible amount of flavor was left behind on the palate after each gulp. Overall, I thought this was an ok beer. It’s definitely worth a try and it would be perfect for a Summer brew. The drinkability was killer and it wasn’t over the top with flavor or nuances. It would also be a great drink for someone wanting to dip their toe into the Saison realm. It was proper and well made albeit a bit underscored. 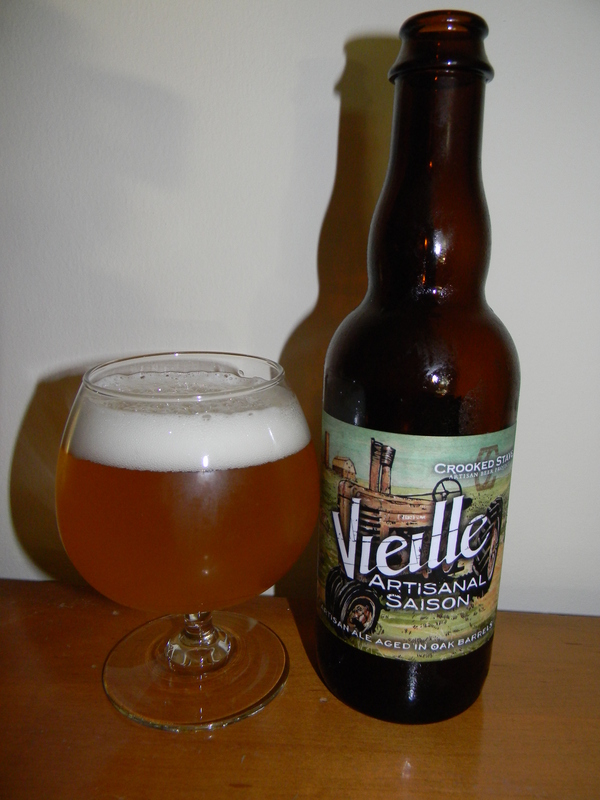 So, if you guys have the opportunity to try the Crooked Stave Vieille Artisanal Saison go for it and see what you think. Be sure to leave a comment and tell me all about it when you do.